In the years following World War II, returning soldiers enrolled at Wheaton College to pursue their college degrees. While the popular G.I. Bill assisted in paying the tuition and living expenses of the veterans, many of the former soldiers’ wives also worked outside the home to support their families. 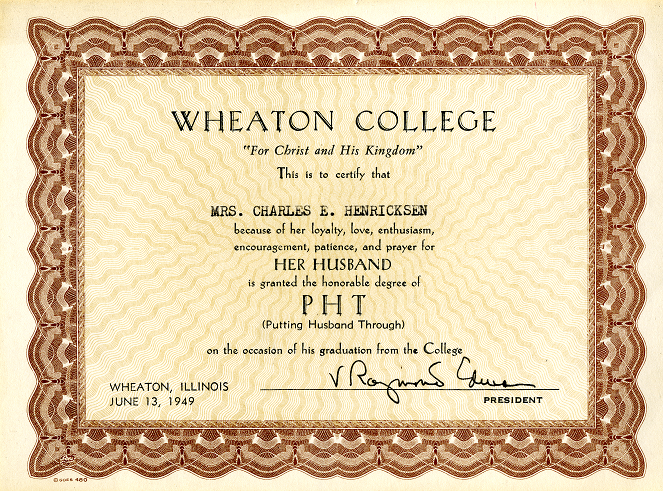 Wheaton College President V. Raymond Edman observed this service, and to acknowledge the wives’ significant contribution to their husbands’ education, created the “Putting Husbands Through” or “PHT” honorary degree. One recipient of this degree was Joy Henricksen. Joy worked at the Wheaton Academy to support her husband Charles’ Wheaton education. Charles had served in the Air Force as a bomber pilot in Europe during the war where he had flown 30 missions. After returning from the war, he married Joy, before enrolling at the University of Arizona and then transferring to Wheaton. When Charles graduated from Wheaton in 1949, President Edman presented Joy with her “PHT” certificate. Joy and Charles’ daughter Susan reported that her mother was always proud of this recognition. Joy even directed that it be mentioned in her obituary and in the eulogy at her funeral. Susan recently donated her mother’s cherished certificate to the College Archives, where it witnesses to Joy’s service, as well as the contributions of other World War II-era wives.